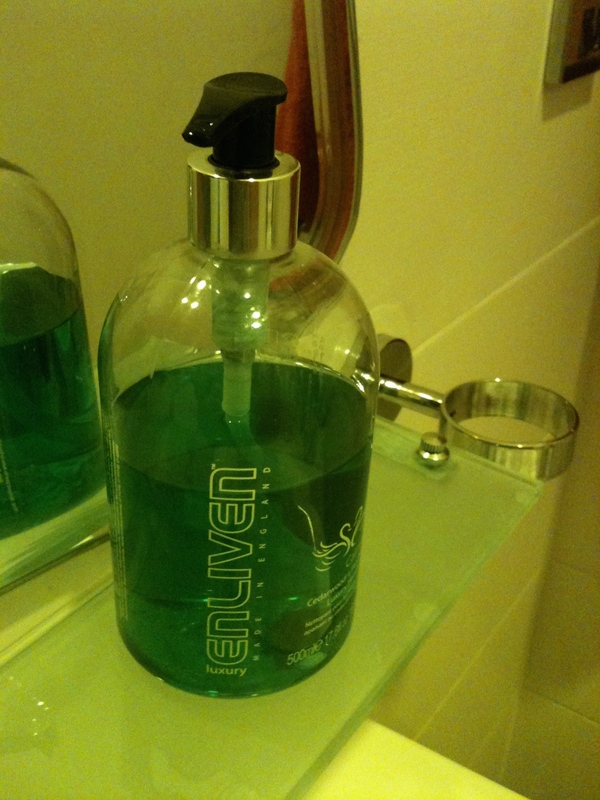 Manufacturing in the UK allows companies to control supply, guarantee quality, offer flexibility and to be ethical and environmentally sound. You and your company or organisation or club or school or university can support British companies and British jobs and be environmentally friendly (by reducing your carbon footprint through reducing the miles goods are transported) by buying British at home, at work and for school. A good starting point is to buy only British made stationery (pens, pencils, staplers, paper clips, scissors, paper, files, etc.). Don’t order stationery unless you know where it is made. Refuse to buy cheap foreign made stationery. Buy British stationery for your workplace and home and it will last longer and so save you or your company money long term. Most stationery these days is foreign made but you can insists on buying British made stationery. Just say 10 years ago most stationery was made in the UK, but sadly this is no longer the case.Most stationery these days is foreign made but you can insists on buying British made stationery. Just say 10 years ago most stationery was made in the UK, but sadly this is no longer the case. 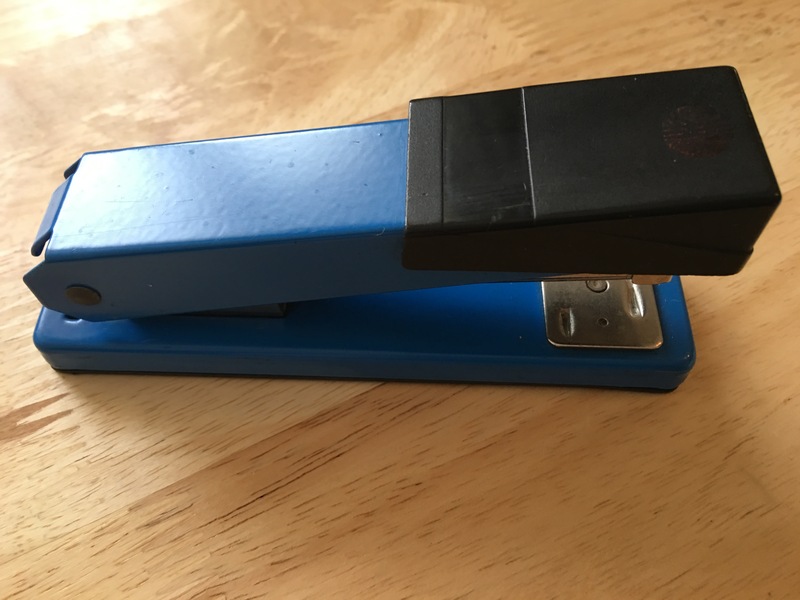 We all know those cheap Chinese made staplers don’t last 5 minutes, whereas the old made in England stapler that has been floating around your office since who knows when is still going strong! 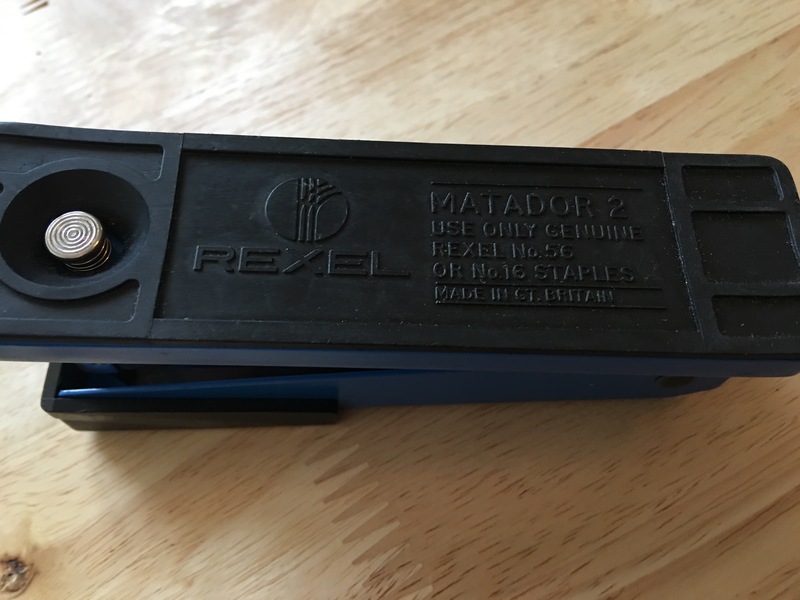 My old made in England Rexel stapler is superb quality; modern Chinese made Rexel staplers are very poor quality and do not last very long at all before they are broken. 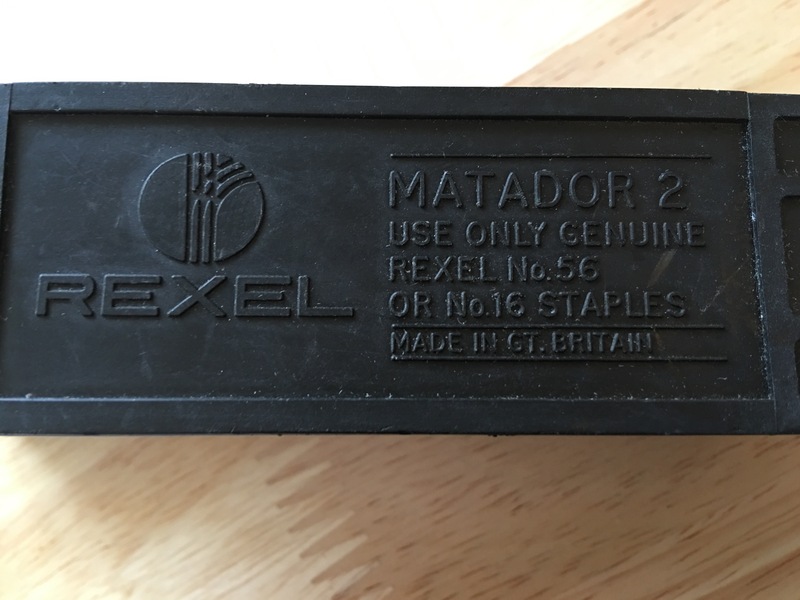 An old made in Britain Rexel stapler. Still going strong after many many years. Photograpgh by author. An old made in Britain Rexel stapler. Still going strong after many many years. Photograpgh by author. Base view 1. An old made in Britain Rexel stapler. Still going strong after many many years. Photograpgh by author. Base view 2. 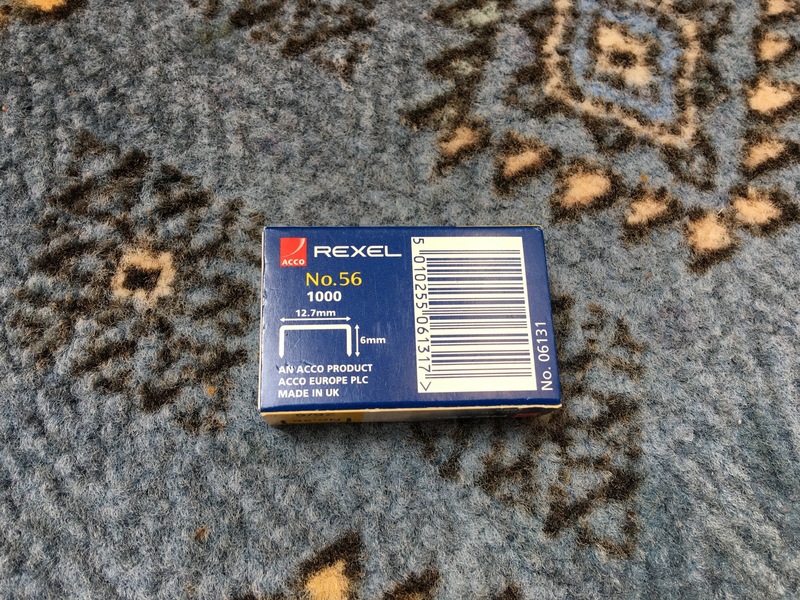 A vintage box of made in UK Rexel No.56 staples. Sadly Rexel / Acco staples are now foriegn made. Photograph by author. This entry was posted in Bartuf Systems, Display Units, Fridge Magnets, Furniture and Soft Furnishings, Household products, Office and Office Supplies, Photo Frames, Ropes / String / Twine, Royal Warrant Holders, SELVYT cloths, Silvine, Stationery, String / Twine / Ropes, Town Talk, Wool and tagged Abbey, Abbey Manufacturing Stationers, Air Wick, APL Chemicals, Art and Craft Factory, Artbox Design, Arts and Crafts, Astonish, Back-to-School, Bartuf Systems, Beyond the Fridge, Bisley, Blue-Tack, Bound by Hand, BowlPhish, Brannan, Brian Clegg, Brill Cleaner, Britannia Fire, British Made Stationery, Bullbarrow wheelbarrows, Buy British Made Cleaning Products, Buy British Made Hand-Dryers, Buy British Made Stationery, C Roberson and Co, Castle Melamine, Cathedral Products, CD Group of Companies, Chef Whites, Children, Children's Stationery, Civil Service procurement, Commonwealth, Concord, Concord Filing Products, Courage and Progress, Craftshapes, Craven & Co. Ltd, Customworks, Daler-Rowney, Deanprint, Desk Accessories, DP, DREMM, Dri-Pak, East Lancashire Chemical Company, Ecoegg, Ecozone, Emma Burningham, Evohold, Fabmania, Faire Brothers, Faire Brothers & Co. Ltd., Faire Brothers Stationery, Faire Brothers Treasury Tags, Faith in Nature, Fireblitz Extinguisher, Flowstrip, Fobkeyrings, Frith and Company, FX Fire, Go Stationery, Government procurement, Guys Magnets, Hancock's Marking Media, Handmade Wales, Harris & Jones, Hewitt and Booth, ILFORD Photo, India, Ink and Thread, James Cropper, James Lever, Janitorial Supplies, John Lewis, Kennett and Lindsell, Lancaster and Gibbings, Lane, Leathersmith of London, Letterpress Design, Lollipop Designs, Mark + Fold, Marlow Ropes Ltd., Master Ropemakers, Master Ropemakers Chatham, Mastermark, Maun Industries, Maxima, Metroplan Limited, Milliput, Milomade, MPM Consumer Products, NHS procurement, Noble Macmillan, Office, Office Supplies, ola, Oliver Harvey, Oliver Harvey Chef Whites, Orchard Melamine Products, Outhwaites Ltd., Paper Things, Party People, Paterson, Photo Frames, Police procurement, Premier Grip, Prime Industries Limited, Pritt Stick, Procurement, Pukka Pads, Regray, Replica Ltd, Robert Scott and Sons, Ropemakers, Ropesource, Rowland Sandwith Ltd, School Stationery, School Supplies, Seawhite, SELVYT, Silvine, Sinclairs, Spur Shelving, Spyrabase, St Cuthberts Mill, Stamford Notebooks, stationery, Stationery made in the UK, Sticky Products, Stoneywood Mill, String, Swanline, Tableau, Teacher's Stationery, Teachers, Teepol Products, The Bio-D Company, The Card Gallery, The Fridge Magnet Shop, The Green Gables, The Original Book Works Limited, The Traditional Rope Company, The Yorkshire Envelope Co., TouchscreenKleen, Town Talk Polishing Co. Ltd., Trader Supplies, Treasury Tags, TWP, Typoretum, UK Adhesives Ltd, UK Lanyard Makers, Under Cover, Unique & Unity, Vanessa Bee, Waitrose, Wedding Stationery, Weston Boxes, Windmill Printing, Winsor & Newton, Workplace Supplies, www.artandcraftfactory.co.uk, York Haven, York Haven Carbon Paper on May 24, 2013 by ukmade.